Apocalymon is an Unidentified Digimon whose name is derived from the Apocalypse. He was the final villain faced by the DigiDestined in the original Digimon series. He was originally created from the data of Digimon who were deleted while trying to digivolve, as a Digital World version of the process of Natural Selection. As such, he feels great bitterness toward both humans and Digimon alike, and has the power to revert Digimon to their Rookie levels. Apocalymon (Psychic) was added to Korean Digimon Masters on October 31, 2018. Apocalymon (Psychic) was added to Global Digimon Masters with the November 20, 2018 Patch. Note: Apocalymon (Psychic) do not Digivolve, it has an own unique system. Death Claw Pitch Black attribute 2 seconds cooldown 144 DS consumed 2 skill points per upgrade Learned at Lv. Darkness Zone Pitch Black attribute 12 seconds cooldown 1128 DS consumed 2 skill points per upgrade Learned at Lv. Gran Death Big Bang Pitch Black attribute 6 seconds cooldown 565 DS consumed 3 skill points per upgrade Learned at Lv. 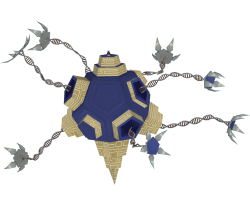 The third skill is an area of effect hitting every enemy around Apocalymon. This page was last modified on 5 April 2019, at 22:30.